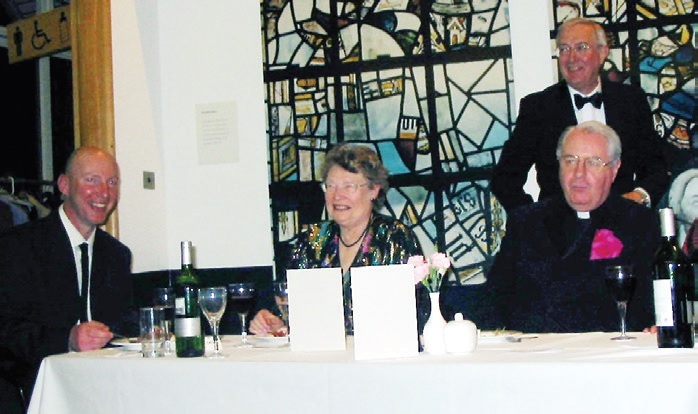 This year is the 125th anniversary of the formation of the Winchester and Portsmouth Guild and seventy people gathered at the Cathedral Refectory in Winchester on the 24th of April for an excellent meal. The Guild Master, the Revd. Barry Fry, acted as Master of Ceremonies. Beryl Norris, Master of the Guildford Guild, proposed the toast to the Guild and Derek Jackson replied. Both speculated on the challenges ringers faced in 1879 when Rev. Arthur du Boulay Hill founded the Guild, there being just a few isolated groups in the Diocese who could ring changes and transport being such that it took three days to travel across the Guild's territory. 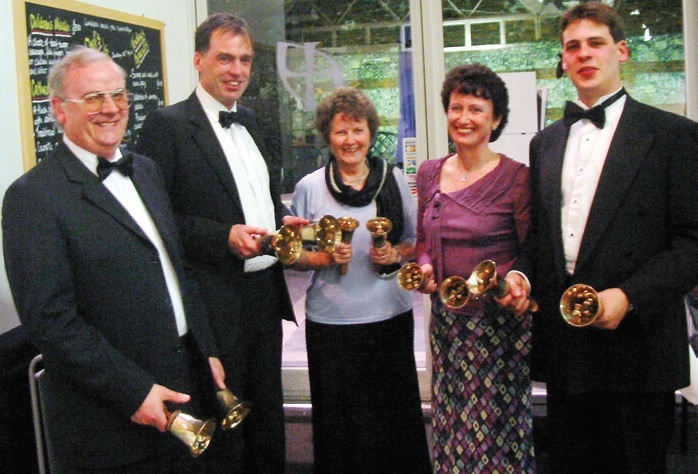 Richard Thompson, Philip Gorrod, Gail Cater, Liz Thornton and Jonathan Hetherington then rang three leads of Kent Royal on hand bells before speeches continued. Bob Cater (having recently moved back to his home county of Yorkshire and believing himself and Gail to be the Guild's northernmost ringing members) proposed the toast to the visitors and the Most Reverend Richard Palmer replied on behalf of the visitors. During the meal Colin Cook asked for support for a new initiative by the Winchester Cathedral Band to encourage young people to learn to ring - they have arranged for bell ringing workshops to be included for the first time in the Winchester Cathedral Leavers' Days being held from June 2nd-24th for children leaving church primary schools. Mark Esbester drew winners from his random number generating plastic bag in the Guild's 200 club, which last year raised £800 for the Guild BRF. Peter Niblett won the top prize. After the formal part of the evening came to a close, many people stayed to catch up on each other's news.